Product prices and availability are accurate as of 2019-04-05 21:03:50 EDT and are subject to change. Any price and availability information displayed on http://www.amazon.com/ at the time of purchase will apply to the purchase of this product. 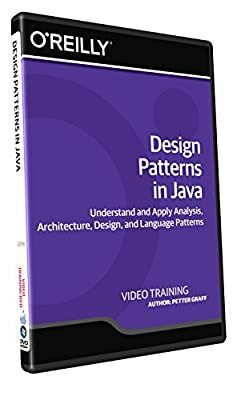 In this Design Patterns in Java training course, expert author Petter Graff teaches you about the most commonly used design patterns and how to select the correct pattern. This course is designed for users that already have some knowledge of object-oriented programming and design. You will start by learning about the value of design patterns, then jump into learning when and when not to apply design patterns. This video tutorial will then cover the most commonly used Gang-of-Four patterns, including abstract factory, adapter, builder, command, composite, observer, strategy, and prototype. Once you have completed this computer based training course, you will be fully knowledgeable of the most commonly used design patterns, as well as be able to select and implement the correct pattern. Working files are included, allowing you to follow along with the author throughout the lessons.